Home > News, Blog & Events > How has CPD given my career a new lease of life? I have worked in research support for many years now, starting my first lab role in a veterinary lab in 1987 and my first research assistant role in 1988 when I joined the team of the (now) Prof Coen FRS at the John Innes Centre in Norwich. It was the beginning of Molecular Genetics and an exciting time to be in research. We identified a key gene essential for flowering in plants, and then quite a few more, using transposon tagging. In 1998 I moved back to my home city of Manchester and had a chance to learn more about Biochemistry. I worked for several groups with the theme of protein movement within cells until my daughter was born in 2000. I decided then to take some time away from science, returning to the bench in 2007. More recently I moved to the Manchester Institute of Biotechnology (MIB) to a very different kind of work, which has brought new challenges. I am currently supporting SYNBIOCHEM, one of six Synthetic Biology centres around the country and am part of a large team using new high throughput technology and computational DNA design to build new pathways for the production of fine and speciality chemicals. This has again brought new and enjoyable challenges and it’s really fun to work as part of a multi-disciplinary team. My journey to being involved with the Science Council began when I went to a meeting about professional registration, run by my previous manager who is now registrar for the Institute of Science and Technology (IST). I loved the idea of being able to evidence the lifelong learning I have always embraced to stay on top of new developments and ideas. I value this recognition for support staff who often develop their skills and experience on the job, but who previously didn’t have anything on paper to demonstrate this journey. Especially today where it’s likely that technical staff will change jobs during their careers, it’s great that this award can be taken with us, even between industry and academia. I completed registration as a Registered Scientist (RSci) in 2013. One of my CPD goals was to organise the technicians’ seminar series for my faculty. This helped to develop my personal responsibility and interpersonal skills. I was given some initial guidance by the previous organiser and my technical manager, then built on contacts I already had to make plans for the programme themes, the timing of the seminars (inviting feedback on both), and recruited volunteers who helped put up posters in their work area and helped tidy up after each event. To promote the seminars, I sought advice from a colleague and used posters, faculty emails, plasma screens and word of mouth. I booked the catering and the meeting room well in advance. Each week I made sure the speaker was still OK to present, and checked what form their presentation was in. Fitting this around the lab work was challenging but my supervisor was supportive. In a nutshell, I would not be doing my current role, which I thoroughly enjoy, had I not embraced professional registration. I met my current co-Director through organising the seminars. It’s given my career a new lease of life. As another CPD goal, I trained to become an assessor for the IST and plan to volunteer as an assessor for the Science Council in the near future. I have helped several Registrants at the University of Manchester to complete their paperwork and have run two workshops on registration for the University. This helps promote professional standards both in my own work and the way I assess applicants, and also raises the standards of those who we are assessing as we offer feedback and advice on areas for their professional development. 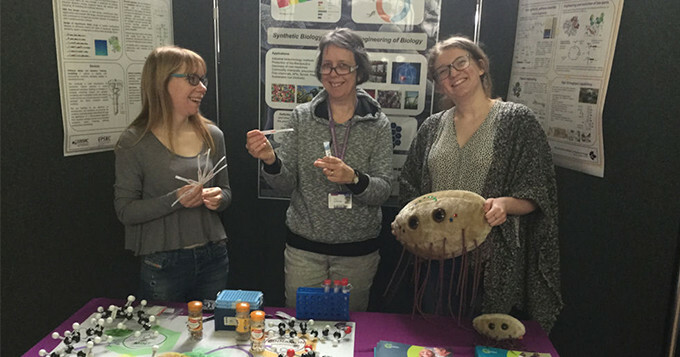 As a third CPD goal, I have taken part in several outreach events; explaining science to the public and to school students, which has been fun, as was helping to organise March for Science Manchester. It’s surprisingly challenging to take the scientific knowledge and understanding that we have and explain it in a way that the public will understand. I also engage a lot with HEaTED, who support networking events for HE staff and professional development, including training. For one year I organised their NW networking meetings. In my career I found the best way to learn something new is to ask for help from someone else who is already successfully doing it. Sharing best practice by professional networking is a great way to learn and develop professional practice. And last year, I was asked by the IST and by the Science Council to become a Registrant Champion, and to share my story in a blog, so here it is. I so often get asked “what’s the point of professional registration?” or “what’s in it for me?” or even “why should I have to pay for it?” I would say if you care about job satisfaction, having pride in your work, meeting with others to share experiences and expertise, then just maybe, you will find new opportunities and new horizons from being a registered professional scientist that you didn’t know were there. Just go for it!